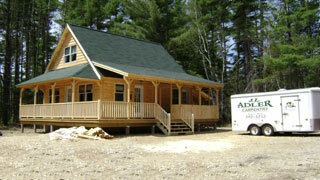 Powder Ridge: We built this custom 2 story, 2 bedroom/2 bath log sided home in Powder Ridge in Newry, Maine which we designed and built from scratch. 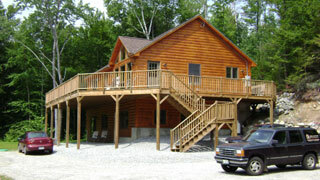 The home features a large deck and cathedral ceiling. We built this home in just over 3 months. 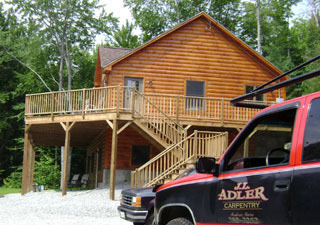 We did everything from the log siding to the extensive pine. References available. 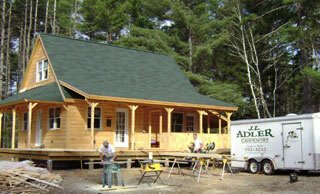 Small Log Sided Cape: This Small Cape Features a large wrap around screened in porch and deck plus a car port. 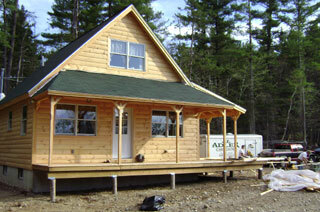 This is a 2 bedroom 1 bath home that we built in just under 3 months.